I decided to move all the Hinton Compatriots posts to this new dedicated blog and and at the same time to regain control of Lazylimeys Wargaming Place for more general posts. I will also eventually link from here to a web page that will show all the figures and allow ordering - this make take a while though! so meanwhile still order via email link on Pricing Page (click on the left). As you know this is more a labour of love than a business and so I am funding almost all this project myself - the number of folks actually buying figures would not justify the costs in a normal business case. 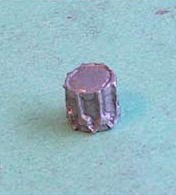 I also have not cut corners on the sculpting - Andy Stadden is one of the finest figure sculptors around and the casters are noted for quality castings and the metal they use is of the highest standard. I received a comment from Jay regarding the possibility of producing a few 'personality figures' - this was a good question and something I had been pondering already so I decided to take the answer to the blog and maybe also get some input. Despite the inherent costs I have indeed considered a few 'personality figures' - even though not many would actually be produced since by definition they are unique and therefore not many required. I therefore had to concentrate on the figures that would be required in larger numbers to justify the cost of the sculpting and the mould making processes. The 'frock coat' or Oberrock clad officer was an early identified and desirable pose (ANC10 Field Marshall is wearing one) as was a drummer with shoulder slung drum. 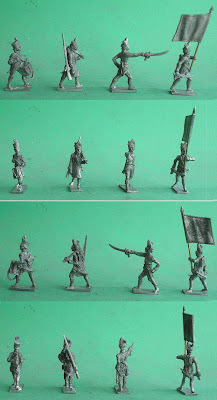 The additional difficulty with the Austrians is the need to produce two types for each figure - Hungarian and German - add to that the need for Helmet, Shako and Grenadier types and you see that the moulds multiple quickly. I have commissioned and have a master for a fusilier that has no head and a hole in its neck together with three separate heads for the above types. The objective was to produce a figure and make it available with the three separate heads which would alleviate the need for different moulds. An additional head without any hat would be a simple addition to these. 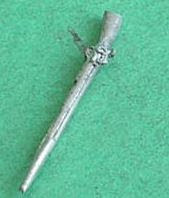 Andy did a great job on this but we both felt that the final cast figure might not be as precise as the masters and might cause some problems with fitting for the end user - the heads and spigots are after all quite small. 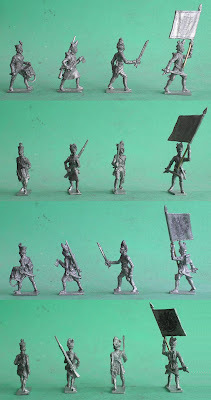 I also have masters for a drum and a musket for conversion of these figures (and others). So you see that although I would very much like to produce some personality figures I am not sure I can justify them yet. The question is what do other folks think - what figures - besides an Officer with Oberrock and a Drummer with a shoulder slung drum and a bare headed Fusilier - would be nice to have. What do folks think about figures with separate heads and how many folks would buy the 'personality figures' any if say they were in a pack of about four? And finally would you be prepared to pay extra for them? Besides this I have several conversions already of various Hinton/Clayton/DK figures and I am going to make masters of them for my own use - again I will make them available to others - but you must understand it's a grey area when you convert a figure to which you do not have rights to! However unless somebody steps forward after all these years and claims the rights to my converted figures then I will proceed. 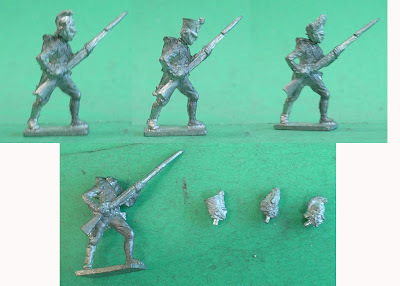 French Line Horse artillery, Bavarian Drummer, Ensign and Pioneer, French Line Drummer with slung Drum, and other figures that are difficult or impossible to get etc. I welcome, encourage and look forward to your comments! As before the all standards are separate and may be substituted with your own staff and paper flags as is desired. These fine Andy Stadden designed figures will be going to the caster shortly and I will be setting prices as soon as all costs are in. With luck Artillery will be next!